First date today with the new lady in my life who I plan on being with for many many moons and miles. My fourth Harley from Colonial Harley-Davidson. I'm a pain when purchasing something new, and they always handle me well, and I always leave feeling nothing but positive about the deal and the experience. It's very comfortable at this dealership and you don't feel like you're on the spot with salesman ready to pounce. It's very chill and very friendly With the package they created for me, they blew away every dealer in Richmond, Virginia Beach, Williamsburg and Northern Virginia. 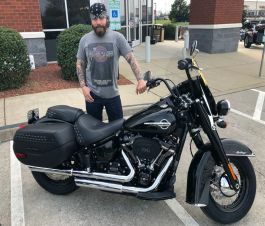 Big thanks to Mike Lewis in sales, Tommy Thompson back in the business office and Dave in service for sending me away smiling on this 2019 Harley Heritage 114. And a giant thanks to Bob Snyder who runs the whole show, who if General Patton rode a Harley and had a little nicer disposition, he'd be Bob Snyder. Bob keeps a tight and professional ship running better than any well-oiled machine I've seen in the motorcycle business. He's been there for every one of my purchases and has made everything seamless and always, ALWAYS looking out for me and every customer I've seen him interact with, as does everyone here. The guys in parts are phenomenal, knowledgeable and go the extra mile to contact you with updates about orders for special parts if they don't have them in stock. You will find no better team than the one at Colonial Harley-Davidson!